I’m certain we’ve met in person, but it was only a few months ago that I connected online with Pratibha and somehow we hit it off real well. We soon discovered that we had lived rather close to each other at one point of time, and Pratibha’s family lived right next door to my uncle! Talk about it being a small world. I am very impressed with Pratibha’s blog and how hard she works to get out wonderful content with a focus on green and natural. Be it information on products, e-stores, DIY tips, she’s got it all covered! Do connect with her. Thanks for visiting and contributing a wonderful post today, Pratibha! Pratibha bid adieu to the corporate world over 6 years ago to be a WFHM. It gave her space, time to be with her twin boys and manage work too! She manages partial social media activities for brands; dabbles in a bit of photography, manages her own blog (PratsMusings) and loves creative writing. Recently, Pratibha has started contributing to Elephant Journal. Connect with Pratibha via her blog, PratsMusings, and on Twitter, Facebook and Pinterest. I love drinks (not the intoxicating ones!) that keep me healthy and energized to tackle the boys and my action packed day. I used to be addicted to energy drinks till I discovered natural and cost-effective ways of getting the required energy levels. This year I made a resolution to look after myself. Be attentive to what I eat and drink. No, it wasn’t a “I want to lose weight” resolution, it was more of a “I want to be healthy” resolution. Let’s get one thing straight here; there has always been a myth that detox drinks help you to lose weight. The truth is that these drinks help to flush out the toxins from your body and thus it keeps your body healthy, makes you feel less bloated and keeps you energized. Let me introduce you to some of my favourite drinks! I can never get tired of this drink! This is a typical winter drink because it needs to be sipped when it is warm. Boil about 200 ml of water and add quarter a spoon each of raw coriander, fennel and cumin seeds. Take the water off the gas and put a lid on the pan. Let the seeds steep in for a while and drink this water when it is warm. Coriander seeds aid in digestion and help ease menstrual problems for women. Fennel seeds are rich in antioxidants and help enhance the production of red blood cells. They also aid in digestion which is why you see most restaurants serve fennel seeds post a meal. Cumin seeds are an integral part of Indian cuisine. Cumin seeds provide the heat to your body that helps keep the common cold and cough at bay. This is one of my favourite drinks. Most of the ingredients are always there in the Indian kitchens and even if they are not, you can get these at the local vegetable vendor. What you need for this is one cucumber washed really well. Retain the skin if you wish to, I like to keep the skin on because it adds colour to my drink. Chop it roughly. Add a handful of fresh mint leaves (no stalk please!). Add the juice of one lemon, an inch of ginger of about 2 cups of water. Combine all the ingredients in a blender and blend till it is a smooth mixture. Drink it as is, do not strain it. Mint and lemons are known to detox the blood and the juice of a lemon also helps to flush out the toxins from the liver and kidneys. Cucumber is rich in Vitamin B and the high water content and dietary fiber help to flush out the toxins effectively. In the summer, add some ice to the drink and enjoy a chilled and a healthy smoothie! Just a warning though, I would not recommend this as your first detox drink as this can make you feel a bit queasy if you are not used to detox drinks. And with the summer setting in pretty quickly, here is another drink that you should include to get rid of the toxins in your body. Sliced apples, one stick of cinnamon and one sliced lemon. Oranges and lemons! Just add slices of oranges, one sliced lemon and some mint leaves. Store the water overnight in the refrigerator and sip this through the day. These drinks are rich in Vitamin C and all the ingredients help to flush out the impurities and toxins from your body. You can choose any variations that you want, but ensure that you change the ingredients every 24 hours because the fruits and veggies will lose the nutrient value. Also flavoured water is a nice change in comparison to normal water. Please note that detoxification is the process of eliminating toxic substances from your body. There are lots of detox diets and drinks available on the internet. It is advisable that you check with your GP if you have any health concerns before you consume any of the drinks. That was definitely a rich article Pratibha! I was aware of the first one with the coriander, fennel and cumin seeds. But it was nice to know the various combinations we can make. Thanks for sharing! N the best part is they all seem easy! I love the fact that all the ingredients are already in my kitchen or 5 minutes away in the shops. This makes it all the much easier to try your detox recipes. I like to try and stay as healthy as possible and I’m now interested in getting those toxins OUT of my body. Great post and thanks for the tips especially when it comes to making water more tasty. 🙂 I am sure that you will love these drinks. Just plain lemon wedges in the water also makes an awesome drink. I love to play with flavours so I tend to add more than one fruit and veggie all the time. Homemade flavoured waters are the best! I have been sticking to this for at least a year now! I do the coriander seeds water in Summer here.. very much needed with the heat. Cucumber and mint smoothie looks delicious! Will try it out for sure! 🙂 as well as the detox water! Thanks Pixie! Will look forward to know how you liked it! Welcome Fabs! Do try the recipes and let me know how you liked them! I’ve seen flavoured water like this once before and have been meaning to do this for a while. Great recipes and also thanks for sharing the benefits! Welcome! Flavoured water is one of my fav’s too! There is so much variety you can add to it! 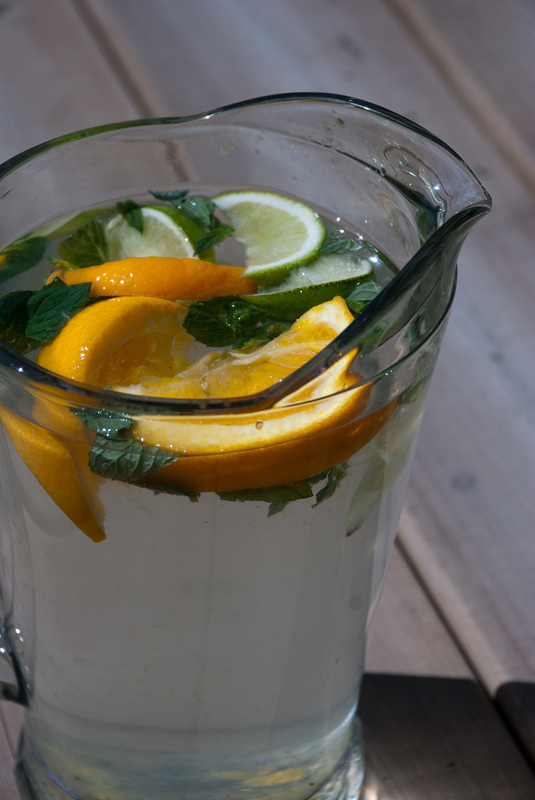 Add some mint leaves to the water Sid and you have a drink that is absolutely refreshing! Shefali, it tastes yum too! ! I love the idea of both your detox drinks. 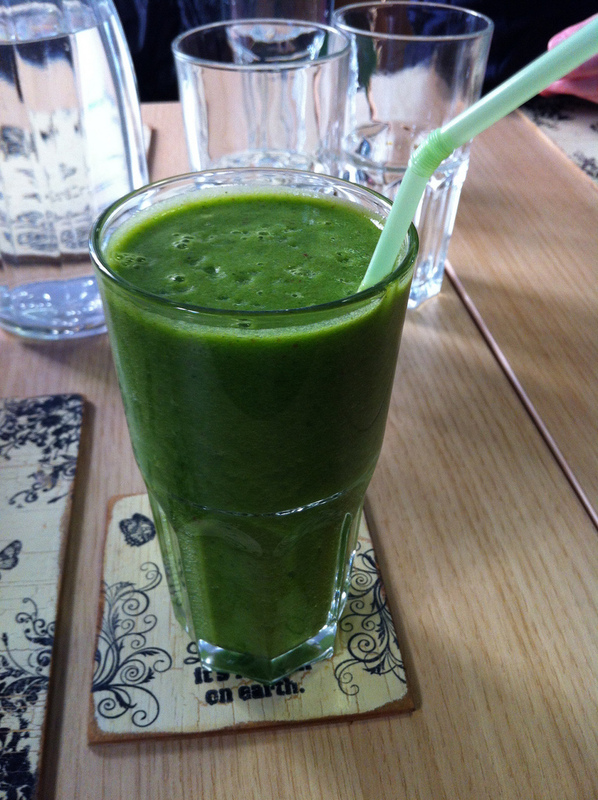 I have a new super-blender and have been making a “green machine” drink with fruit, spinach and kale that I just love. I’m inspired to try the cucumber drink next! Thank you Betsy! I am sure that you will love trying these! These are great ideas, especially for those who don’t get their required fluid intake. I love mint and cucumber, so that smoothie is a must try for me!! Thanks for a lovely post! I especially like the fruit slices, it is definitely a refreshing change from plain water. Also trying to get healthy and have been using Apple Cider Vinegar lately. It is helping but some days I feel worse than others. I have read that in the process of detox you can actually feel worse as the toxins are being thrown off. Optimum health is what we all would like. Did a raw fruits and vegetables for 3 weeks a number of years ago. After 2 days of juices I was eager to get some substance. So went to whole food for some of the time. But after 3 weeks I was feeling better than I ever have and also lost weight. Couldn’t stay with it when others were home, so abandoned it. One day maybe I will go back to it for a short period. It was easier when there was a huge variety of produce in the summer. I’m going to try these, thank you! I have tried flavoring water with different fruits in an effort to drink more water during the day. I will have to give some of your recipes a try. Would love it Kathy! Do let me know which ones you loved! Mint and cucumber! How wonderful! Interesting. Must try this out. Btw we have a health drink prepared by my husband each morning, in which pieces of all vegetables and leaves available in the kitchen like cucumber, carrot, snake gourd, bitter gourd, radish, curry leaves, drumstick leaves, pumpkin, etc find a place. Finding such a great collection of easy to make and drink recipes under one post is a wonderful surprise. Pratibha I quite like the clarification you gave on detox and losing weight. The fad to be size zero or rather keeping a thinner waist has quite taken the attention off being healthy. Hmmm…. Sounds interesting, this idea of flavoured water. The one with citrus fruits sounds the best. The best part is that you can add any fruit you want! I love to add melons too, it makes a very fruity water that is awesome to drink. Lovely…this is something that I can definitely do, so will try for sure! Welcome Kajal! All these drinks make water more interesting. Trust me, I can now drink more than the required intake of water! Love the flavored water detox…and what a pleasure to see you here, Pratibha! 🙂 Staying healthy is a better goal than a weight loss goal! Great post + recipes Pratibha. Thank you for sharing them. I have been asked by my doc to lose weight and these drinks are just the thing I need. Thank you Corinne for sharing this with all of us. Priti, for a change you would like to try something I make! that is a huge compliment! Flavored water is a lovely idea. Gonna try it today. Danny, these are just extra ways of consuming more water and helping to get rid of the toxins from your body. Adding flavour to the water just makes it interesting. Yaaay! I finally get to feature on your blog! Thanks a ton. February has been such a wonderful month for me. And you just made it more awesome by publishing my post! Thanks Corinne! I know, I feel that this is the start of all things good!